Cindy with her granddaughters Zoe and Isabel on a recent visit to Canberra. The National Museum’s People’s Walk campaign gives donors the opportunity to have their name, or that of their loved ones, etched into a walkway within the new bush garden forecourt near the Museum’s entrance. Long-term Museum Friend Cindy Young recently purchased a paver in the People’s Walk for her granddaughters, Zoe and Isabel. 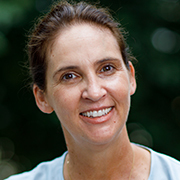 Originally from the United States, Cindy arrived in Australia in the 1980s and now calls Canberra home. Cindy joined us to discuss the importance of museums and why she chose to add Zoe and Isabel’s names. Karen: Why is the National Museum of Australia important to you? Cindy: It feels like there has always been a National Museum of Australia — at least for me. When I first moved to Canberra in the mid-1980s, there was a small collection on display in a building at West Basin. I had just moved to Australia and didn’t know much about Australian history or culture. The Museum provided a crash course in the story of Australia. When the permanent building opened in 2001 there was so much more to see than just Phar Lap’s heart! Karen: Why did you decide to donate to the People’s Walk? Cindy: It was a big decision for me to support the People’s Walk by purchasing a paver, as I’m sure it would be for most people. Although the idea captivated me as soon as I heard about it, it is a big commitment. In the end, the opportunity to do something that would connect my grandchildren to the timeline of Australian history was too compelling to ignore. I am thrilled their names will be part of a continuum stretching back 60,000-plus years, and stretching forward into the future. By placing their names into the Museum landscape, their stories become symbolically part of the greater Australian story, and my own story lives on through them. Karen: Why is the National Museum of Australia important to your family? Cindy: Now that I have grandchildren, the Museum plays an even more important role in our lives. Sometimes we visit the Museum for a particular purpose, but not always. You could say we have a very casual relationship with the Museum — we often just drop in to see what’s happening. We’re all Museum Friends. If we are not viewing a special exhibition, we’re looking at the permanent collection, relaxing in the cafe or Friends Lounge, or building a robot in Kspace! Through the fantastic program of school holiday activities, the kids have done everything from building a medieval city, to creating a botanical journal, to making Lego structures. These activities connect to the stories held in the Museum, and help the kids understand their own stories. Karen: What is the role of museums today? Cindy: I guess the traditional view is to think of museums and other cultural institutions as collections or archives that are made available to everyone. Yes, that’s important. But even more, they serve as connectors between people of different cultures and generations. A good museum enables us to experience and contemplate things bigger than ourselves. Who wouldn’t want to support that? The Museum is aiming to raising $2.5 million to help transform the forecourt. For a tax-deductible gift of $1000 your name, a family name or that of your loved ones will be etched into a bluestone paver in the People’s Walk. The paver named for Zoe and Isabel will be among those unveiled when the new forecourt opens in late 2018.